I recall my first national publication in Yojana in June 1993 issue which reviewed the efficacy and status of India’s environmental legislation, following the strategic article by then Prime Minister Late Sri Narsimha Rao depicting the concern on environment and extrapolating it for sustainability of economic growth. India has a prestigious history on environmental fronts - be it the Stockholm Conference in 1972 which was attended by Late Smt. Indira Gandhi, or the UN Conference on Environment and Development, 1992 at Brazil where India’s contribution and eco-concerns also figured in shaping the historic Agenda 21. It was in 1991 that the Hon’ble Supreme Court issued a directive for compulsory environmental studies in all undergraduate programmes in the country. It is regrettable that it hasn’t been uniformly implemented even with the passage of two decades. There are significant efforts to promote green cover in urban areas with noted success, but at the same time vast tracts of natural green cover of forests and rural areas have been lost owing to increasing biotic pressure, low regeneration and devastating side effects of poorly planned developmental projects. India has a new water policy of 2012 now, but without subjecting it to a formal system of environmental assessment, despite having globally accepted tool ‘strategic environmental assessment’ (EIA of policies and plans) in practice. I wrote in Yojana May, 2000 on water policy and integrated water management calling for a system approach, which in turn also calls for coherence of water, land, energy and forest related policies with the broad ‘environment policy’. Fortunately the environment policy of 2006 at least mentioned this. The recent reinforced calls at global level to integrate disaster risk reduction and climate change issues within the broad umbrella of environmental management for sustainability and inclusive growth has attained momentum with the UN led Partnership of Environment and Disaster Risk Reduction (UNPEDRR). The World Bank interpreted the consequences of these impacts in form of severe economic shocks, which will exacerbate existing social and environmental problems, and migration within and across national borders. So far most policy interventions related to climate change were mitigation centric and broadly based on geophysical parameters. However, the focus is now shifting towards vulnerability reduction centric and adaptation approach which at the same time facilitates climate change mitigation-adaptation convergence with disaster risk reduction. The Millennium Ecosystem Assessment (2005) that emphasized livelihood and food security as key challenges of human vulnerability is an insight to understand the significant efforts of Intergovernmental Panel on Climate Change (IPCC), in particular the 4th Assessment Report and the recent Special Report on Extreme Weather Events (SREX) – to draw the concerns for South Asia and more particularly for India. A 4x4 assessment of climate change impacts on India, organized by Ministry of Environment & Forests (2010) has concluded with serious concerns on impacts on agriculture, water security, health and forests, more particularly in Himalayan region and coastal areas. The impacts have been observed in terms of changing rainfall patterns, intensity, number of rainy days, hottest and coldest days, hot/cold waves, sea level rise, cyclonic storms, etc., whereas improper land use coupled with ecological degradation has aggravated people’s vulnerability to these climatic and the other geophysical disasters like earthquake, landslides, etc. Besides the availability concern, quality of water (be it ground or surface waters) is critical in health and agriculture. Air quality is deteriorating despite the efforts governments made over past decades. Waste management situation in many cities of the country has improved but is far from satisfactory, and urban flooding has become a common annual menace. putting a strain on the environment, infrastructure, and the country’s natural resources. The Global Assessment Report on Disaster Risk Reduction: Risk and Poverty in a Changing Climate (2009) identifies ecosystem decline as a key driver in exacerbating natural hazards in the future. Indian economy is likely to grow at 6.4 per cent rate in 2013 outpacing the 6 per cent expansion in developing Asia-Pacific economies in the same period. However, the current projected growth is below its own pace of the past. The global economic slowdown starting 2008 has made us to review on the limitations our ecological systems and non-renewable resources pose to our economic growth. We need to analyze our fiscal balance sheets again for expenditures on managing the challenges arising as a consequence of environmental degradation on different timescales. India is now the world’s third biggest carbon dioxide emitting nation after China and the US. The new emission data from the United Nations published in early October 2010 is a probable cause of worry for India’s climate negations in the future. The ecosystem based approaches for adaptation and mitigation are the noble options we still have. We need to evolve approaches where we have mitigation values for the adaptation options and strategies as well, and at the same time disaster risk reduction as the benefit. We have not only spoiled our wetlands and river systems, but the entire land soil system, making it chemical intensive in its composition in quest of immediate high returns. d) Supporting services, such as soil formation, photosynthesis (food production, oxygen generation) and nutrient recycling. The World Summit on Social Development (2005) noted the reconciliation of environmental, social equity and economic demands – as the “three pillars” of sustainability. An imbalance in one or more of these may exacerbate the impact of a natural or impending humanitarian crisis, resulting in a disaster like situation. The challenges of naxalism may be understood in ecological terms of forests, people and livelihoods, which due to our failure to address, have grown up to emergent state in such areas. Environmental refugees – from the regions affected by natural calamities, insurgencies, or due to developmental interventions like in case of large dams, or migrants for livelihoods are one of key humanitarian concerns worldwide as well as in India. Poor, down trodden and marginalized people, landless, or those occupying low cost but hazardous locations for their housing and occupations, are the ones most and worst affected by natural disasters like earthquake, floods, drought, cyclone and diseases. Relationships between environment and disasters are inextricable. We need to understand the ecology of conflicts, vulnerability, human behavior, and thereby of the disasters, for their effective and preventive management. Ecosystem Approach to Disaster Risk Reduction (ecoDRR) was piloted in Sri Lanka and followed by New Delhi in 2011 itself. Recent release of ‘Disaster Management and Risk Reduction’ (2013) as follow up to the Government of India publication (NIDM) on Ecosystem Approach to Disaster Risk Reduction (2013), that related to United Nations University (UNU) bringing a special volume entitled ‘Role of Ecosystems in Disaster Risk Reduction’. 1. Natural Disaster Management: Number of natural disasters continue to rise in India and the region, with heavy toll on human lives, environment and economies. Losses due to water and climate related disasters far exceed that of purely geophysical ones. On the other hand, chemical intensive economic development has increased the risk of industrial-chemical disasters. Disaster management needs to be a priority subject for intervention as it has great humanitarian aspects. 2. Environmental-Health: Despite the need, the aspects of environmental health including those related with water, sanitation, waste management, Toxicology has been inadequately addressed due to lack of policy intervention. We need to have integrated policy direction on preventive and social health issues in the country. 3. Natural Resource Systems: Be it a river, a wetland, forest, land or soil, urban area or a crop field, the management of natural resources need to be evolved with consideration of these as ‘system’ and with the scientific understanding of ‘resource’ rather than treating them primarily as ‘source’. 4. Environmental liability: Environmental policy implementation cannot be effective unless the concept of absolute liability is enforced not only in context of industrial hazards or pollution but equally in relation to ecosystem integrity, sustainability and natural resources. Liability should be integrated with accountability and must also include the Government, monitoring agencies and decision makers. 6. EIA and SEA improvements: Environmental Impact Assessment is an effective and noble instrument of policy and legal enforcement but, however, is under question in India due to its marketplace image. It requires scientific and academic community to come forward together to intervene and take up research studies on validation of such reports. Another approach where EIAs are done by Government agencies responsible for decision making may also be thought of, but with fixing accountability for their interpretations. Strategic Environmental Assessment (SEA) is a recognized tool for environmental screening of policies, plans and programmes in practice in particular in advanced countries. On initiative of UNU and UNEP, we have worked out a protocol for EIA and SEA application in disaster management. Recently, Sri Lanka carried out an SEA of its North Province before launching post-conflict developmental plan. We need to learn and evolve to scrutinize our economic and other strategic decisions for their impacts on different aspects of environmental quality and resources. 7. Environmental Audit : Environmental audit in mandatory terms is a formal procedure in India, except big industries and corporations conducting detailed audits voluntarily. Practice of comprehensive environmental auditing must be compulsory for all industries, establishments including housing complexes, municipalities, and institutions with significant water, energy and material balance or involving hazards. 8. Natural Resource Accounting: The concept and practice of natural resource accounting or green accounting was mooted and pilot studies undertaken during 1990s. However, the practice didn’t continue to grow. The concept of green accounting and green GDP must be integrated with national and state environmental action planning as well as with developmental planning. 9. Economic evaluation of environmental impacts: In the absence of proper economic evaluation, environmental impacts and hazards are not given due importance in planning and decision making. For example, the environmental damages and losses due to disasters and environmental needs following a disaster situation haven’t been evaluated on economic terms. This results in their undermining. The practice of ecological economics needs to be promoted in research, planning and monitoring of developmental plans and policies. 10. Ecological Auditing (Eco-Audit): This is rather a new tool, extended from the principle evolved a decade ago. This focuses on auditing of natural resource systems and environmental quality aspects on ecosystem approach. This takes into account the ecosystem capacities, services and related sustainability parameters in the context of internal, external and human induced factors. Sustainability is the capacity to endure. In ecology it describes how biological systems remain diverse and productive over time. For humans, sustainability is the potential for long-term maintenance of well being, which has ecological, economic, political and cultural dimensions. Healthy ecosystems and environments are necessary to the survival and flourishing of humans and other organisms. Chennai based Centre for Development Finance has developed Environmental sustainability index 2011 for Indian states considering the achievements, challenges, priorities and present state of environment. The study found the north-eastern states as most sustainable whereas the least sustainable states are Bihar, Haryana, Gujarat, Punjab, Rajasthan & Uttar Pradesh. Poverty, disparity and inequality are key factors that aggravate people’s vulnerability to hazard – be it of a natural, human-induced, technological or socio-political origin that may result in a devastating situation or crisis. These factors are in turn aggravated by ecological deprivation and poor management of natural resources, coupled with infrastructure disparities brought in by the techno-fiscal intensification. No model of economic growth can sustain for long if it doesn’t respect ecology in local and regional context, and at the same time the environment as broad concern including the inter-relationships of natural, human-made and socio-cultural environments. Unless we understand the ecological basis of conflicts and evolution of local/ regional terrorism, we often fail to find sustainable ceasefire solutions. Alternative models of sustainable land use economies need to be worked out taking care of climate change adaptation and disaster risk concerns as well. Sustainability interfaces with economics through the social and environmental consequences of an economic activity. Sustainability economics involves ecological economics where socio-cultural, economic and health-related aspects are integrated. Now, in the times when we are calling for ‘Integrated district planning process’, we need to evolve the models and protocols for ‘ecological compatible integrated planning’ at state, district and local levels. At the same time, it is important to recognize the ecosystem relations between urban, rural and industrial development planning. 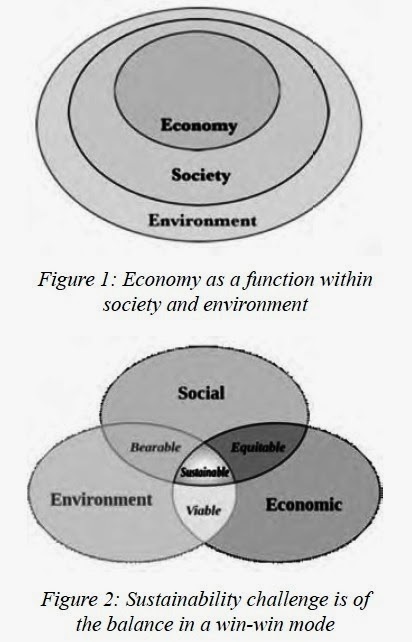 Figure 1 shows economics as a function within social arena of the environment as recognized by Scott Cato (Green Economics, 2009, Earthscan). Adams (2006) enumerated the pressure balance among environment, economics and social functions under a sustainability framework (International Union for Conservation of Nature, Figure 2). However, environmental economics new focus is on the economic valuation of ecosystem services in immediate and long-term parameters that helps understand need for ecological sensitive developmental planning process. In India as well, the concept of Green GDP is upcoming which should help promote sustainability concerns into developmental economics as well. ‘Disaster management’ is a state subject, whereas ‘environment’ is a broad concern divided and shared between central, states and concurrent lists, in the schedules of India’s Constitution. In most cases States enjoy the powers delegated by Central Government. Therefore, an apex agency should not be only an authority to develop broad policies and guidelines but also its own standards, and need to be responsible and accountable for their proper and effective implementation at the ground levels as well. We need to learn from the United State’s model of Environmental Protection Agency. ‘Pollution Control Board’ concepts are obsolete and need to be abolished to bring a cultural change in environmental management, by replacing it with Environmental Protection Agencies’ with a uniform institutional framework at State, district and Urban local bodies level. It is also important that a standard ratio of scientific, technical and social experts is maintained in these agencies at all the levels. system. Prime Minister’s Council of Climate Change may be renamed as Prime Minister’s National Environmental Council offering an umbrella coordination of Ministries like Environment and Forests, Earth Science, Science & Technology, environment related divisions of DST, ICAR, ICMR, DBT, CSIR, ICFRE, ICSSR, UGC, National Biodiversity Board, etc. and international organizations like UNEP, IPCC, WMO, WHO, UNDP, UNESCO, etc. Development and promotion of environmentally compatible models for inclusive growth and sustainable economic development at village, taluka and district levels may be a key objective. Intensive and effective drives of capacity building and awareness shall be needed to attain its objectives. A policy guideline on ‘environmentally compatible integrated district-planning’ need to be developed. It is ironical to note that India as a country 'though loud enough in global platforms of Stockholm and Rio de Janeiro' has missed to represent ecology in its constitution of strategic and planning organizations like Planning Commission, National Disaster Management Authority, National Investment Agency, etc. The time has come when we need to be sensitive to own long-term sustainability and feel accountable for all our deeds. Environmental research in the country is fragmented with much of duplicacy, gaps and sometime with conflicting conclusions. The proposed National Council and National University may be mandated to share the strategic responsibility of organizing and coordinating with the relevant agencies a broad network forum to avoid these challenges. Some of the states/UTs have integrated their science & technology councils with environment, and is a welcome move. University and college curriculum of environmental studies need to be diversified to meet specialized needs for professionals on its sub-disciplines, viz. environmental health, system ecology, climate change, disaster management, EIA, law & policy, environmental economics, industrial hazards, etc. Education and training in environmental studies need be diversified with specializations at University/college levels – to focus on emergency issues and challenges. Our experts and Governments have taken great steps towards environmental awareness of the masses including college youth and children, but could not mandate a compulsory orientation of our legislators and Government officials of all levels including sub-district and local levels who built up the administrative priorities of the governance. This is one reason of increasing conflicts between public or civil society and Government as their perceptions do not match at all. For more than two decades, there has been a demand for a central institution on environmental research and training which at the same time shall award degrees and professional certification in the areas of environment. In the present times, when disasters, climate change and health risks are emergency challenges, a National University on Environment and Sustainability Studies (UNEST) need to be established by the Central Government to cater the needs of quality research, training and education leading to masters and research degrees, and will extend advisory support in assessments, planning and policy making. The institute may be mandated also to host a forum for organizations and institutions working on environment, climate change and disaster management issues in the country, to facilitate exchange of knowledge, skills, and professional value addition. University Grants Commission has supported Universities and institutions on innovative course and research programmes on concurrent issues in environmental sciences and notified a model curriculum on disaster management for all undergraduate course in the lines of compulsory environmental studies. Ministry of Environment and Forests and Ministry of Earth Sciences have also schemes to support environment and climate research. United Nations Environment Programme has expressed concern in promoting the ecoDRR curriculum in Indian Universities which has already been included in other countries. Recently, UNESCO has established a high level academic institute, first in Asia, Mahatma Gandhi Institute of Environment, Peace and Sustainability which will organize and conduct courses and research on environment, climate and disaster related issues of Asian concern. Anil Kumar Gupta : The author is Senior Associate Professor of Policy Planning at National Institute of Disaster Management, New Delhi, and President of Centre for Disaster Management, Environment and Sustainability, New Delhi.